We're Having a White Christmas! Who wouldn't want to have a White Christmas? Now you can with our latest arrivals! 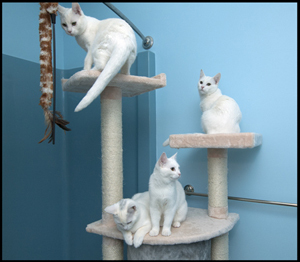 These four sublime siblings are sweeter than sugar and white as snow. Three of them have a delicate brush stroke of grey on their head. They look so much alike we're not even sure which one is which! ©2011 Robin A.F. Olson. The kittens arrive! What we DO know is these six month old sweethearts were orphaned when their mother was killed when they were only a few days old. Bottle fed by one of our fantastic foster mamas, these kittens survived and thrived in her loving care. ©2011 Robin A.F. Olson. Princess & Jazz. 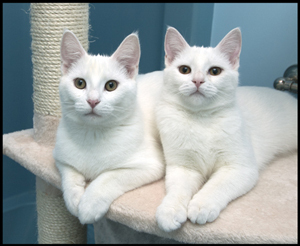 At just over 5 months old, Princess de Winter and her three brothers are ready to be adopted! If you'd like to learn more about them or fill out a Pre-Adoption application, just press the “Adopt” tab, above. ©2011 Robin A.F. Olson. Justin is a LOVE BUG! Read more about We're Having a White Christmas! Greengirlz Holiday Pet Photo Event! Talented photographers Greengirlz are holding a Holiday Photo Event this weekend at Your Healthy Pet in Newtown. And the best part is - part of the proceeds go to Kitten Associates! That's right - get your holiday pet photos, and help us save more cats too. We're so grateful for the generosity of this extra special team - and to all those who take advantage of this extra special event. So head on over to Your Healthy Pet at 224 South Main St, Newtown, CT this Saturday or Sunday, November 19th or 20th. Read more about Greengirlz Holiday Pet Photo Event! Power's Back On & So is Our Adoption Event! We lost power for almost a week and had no internet for a bit longer than that. We're very glad things are starting to get back to normal, especially because we're having an Adoption Event on Saturday, November 12th from 12-4pm at Choice Pet Supply in Monroe, CT.
We'll have lots of cute kitties to choose from so we hope you'll be able to stop by and visit them. They also make great lap warmers when the power goes out (we can attest to that!). For more information, check our EVENTS section on the right side of this page. 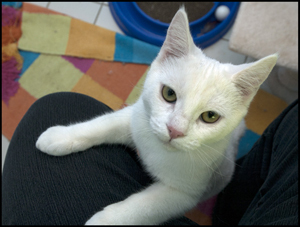 Read more about Power's Back On & So is Our Adoption Event!